Blame it on the “J factor” that dominates its population and politics alike or political compulsion that compels the government to soft-pedal such issues or even the state’s proximity to Delhi; the Jats have made Haryana their chosen battleground for good. Slamming the Haryana government for trying to exempt the land of a politician’s son from acquisition for setting up a ‘mandi’ in Ambala, the Supreme Court today advised bureaucrats to work in public interest and not on political considerations. Commuters had to bear the brunt as a majority of the Haryana Roadways buses could not ply on their designated routes due to a strike observed by the staff of the department in response to a call given by several trade unions, including the Government Employees Federation, in the state. 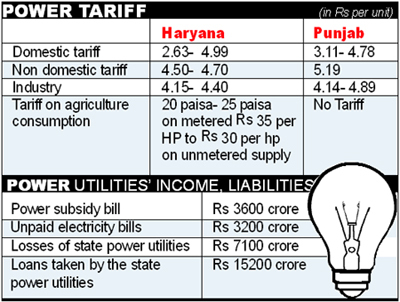 The mounting losses of Haryana Power Utilities (HPU) and the reluctance on the part of Haryana Government to raise the power tariff has ensured that power sector remains a big drain on the state’s limited resources. Contending that Vidhan Sabha Speaker Kuldeep Sharma was behaving like a Congress leader and not like a tribunal for finally deciding the status of five MLAs, HJC chief Kuldeep Bishnoi today pleaded with the Supreme Court to take upon itself the responsibility of adjudicating the case in toto without leaving anything to the Speaker. The murder of Pradeep Jangra, a second-year engineering student, by two classmates has dashed the hopes of family for a bright future. Hailing from a poor family, Pradeep topped his class in the past three semesters. A student of mechanical engineering at Kalpana Chawla College of Engineering and Technology here, he was known as a shy and studious boy who was deeply interested in making a good career to salvage his family’s fortunes. Bharat Sakshar Yatra flagged off by President Pratibha Devisingh Patil from Delhi on February 18 entered Karnal to a rousing welcome with motivational songs to promote female literacy charging the Kalidas Rangshala. With five thermal units at the three thermal power plants in the state down either for maintenance or forced shutdown, the state has been left with no other option but to overdraw 200 lakh units of power every day from the northern grid even in this lean period when the demand for power remains low. The youngest brother of chief parliamentary secretary Sharda Rathore died in a train accident at Old Faridabad railway station last evening. And, their cause? Ask any Jat and pat comes the reply, “We are not asking for the moon. Only for what we rightfully think is ours -- OBC status for our community.” That’s precisely why, over the past two years, agitations are a norm, loss of public property a routine affair, while the common man has ‘graduated’ to being a harassed man and Haryana, obviously, the hotbed where all the action is. But this “fight” is not for Haryana’s Jats alone. It is about a wrangling between the government and the 10-crore strong “secular” Jat community (that’s what Jat organisations claim) spread over J and K, Punjab, Haryana and the rest of the country for what they claim should have been “rightfully” theirs had politics not played spoilsport in the 1990s when the Mandal Commission was implemented. The protesters are demanding reservation for Jats not only among the Hindus but Sikhs and Muslims as well. While they are demanding OBC status at the Centre, the Jats are also demanding reservation in the four states where they are “struggling” as also the withdrawal of cases against a few “innocents” booked in the aftermath of the firing incident at Mayyar in Haryana in September 2010. Consequently, the Gurnam Singh Commission was constituted in Haryana to identify the “left-out” castes which had been “deprived” of the OBC status. The commission recommended OBC status for 10 castes, including the Jats, which was implemented in Haryana when Hukum Singh was the Chief Minister. “However, later, a few months after Bhajan Lal assumed power in the state, the government submitted an affidavit in court, stating that it was withdrawing the OBC status to Jats, Sikh Jats, Bishnois, Rajputs Rors and Tyagis in response to a case challenging the grant of OBC status,” Malik claimed. It was around this time that the National Commission for Backward Classes (NCBC), too, came into being on court directions. “A few social organisations approached the NCBC and put in an application along with applications in the state commissions. The commission rejected our case. They neither had any statistics about the community’s strength nor bothered to invite the organisations for hearings,” Malik maintains. The Jats tasted some success when the reservation ball was set rolling in nine states beginning with Gujarat in 1994 which recognised the Anjana Chaudhrys as OBCs. The other states which granted the OBC status to the Jats are Rajasthan, Uttar Pradesh, Delhi, Himachal Pradesh, Uttarakhand while Madhya Pradesh and Bihar gave reservation to the Jats in the state in 2001. However, their demand kept hanging fire in J and K, Punjab, Haryana and Maharasthra and their discontent continued to simmer behind closed doors. A Supreme Court Bench made the remarks while hearing a petition filed by a person who pleaded for exemption of his land also from acquisition, contending that his land was similarly situated. Roshan Lal, Principal Secretary, Agriculture Department, had to appear in the court today to explain to the Bench the circumstances under which the exemption was sought to be given. Additional Advocate-General Manjit Singh Dalal assured the Bench that though the Chief Minister had on May 21, 2008, ordered the exemption of six kanals of land belonging to Varun Kumar, former Education Minister Phool Chand Mullana’s son , the CM withdrew the letter after being told that the government had taken possession of 25 acres acquired for the ‘mandi’ and as such it was not possible to release any part of it. The Bench was, however, not happy and wanted to know why the letter was withdrawn after a long time. It was formally withdrawn only in January this year. Ultimately, the Bench dismissed the petitioner’s plea after coming to know of the fact that he had also approached the CM’s office, seeking a similar favour. The strike was called in protest against the pension bill and other policies of the government. The protesting employees of various departments staged a protest outside the premises of their offices due to imposition of Section 144 at several places. While there was no confrontation between the employees and the police in Rohtak and Jind districts, the state unit of the CPM has condemned the alleged lathi charge by the police in Bhiwani on Tuesday. Hisar: Haryana Roadways bus services remained suspended in view of the strike by its employees. All public sector banks also remained closed for the day. Passengers had a hard time as rail services from here have also been unavailable for the past 10 days in view of the pro-reservation stir by Jats. Only a few private buses plied on various routes. Work in bank clearing houses was affected because of the strike. Only private banks functioned today. Sonepat: Tuesday’s bandh call given by various trade unions evoked a mixed response in the district. Almost all the government banks remained closed for most of the day. Haryana Roadways buses remained off the road. The services were disrupted before noon but were restored in the afternoon. The passengers were forced to avail the services of private vehicles, including maxi cabs, to reach their destinations. Hundreds of activists of various unions, affiliated with the Sarv Karamchari Sangh and the Haryana Karamchari Mahasangh, participated in a protest march taken out in the town in support of their demands. Bhiwani: Employees of all banks except private banks observed a strike in protest against the outsourcing of non-core activities, among other things. "The strike is against the government's policies of liberalisation, privatisation and globalisation,” said a bank employee. FARIDABAD: Workers of various government departments and industries held a protest march in the city and blocked the Mathura-Agra national highway for about an hour. They lifted the blockade on their own. Workers took out processions in other parts of the district also. Functioning of civic bodies, including the Municipal Corporation Faridabad (MCF), was paralysed. Services of Haryana Roadways, the health, the banking and other sectors were affected in a major way. Sirsa: Banking and transport services remained crippled in Sirsa and Fatehabad due to the nationwide strike. Clerical staff of nationalised banks observed a strike while officers remained on duty, said Harish Khurana, manager, State Bank of Patiala, Fatehabad. However, private banks functioned as usual despite the strike. Though some buses plied in Sirsa, the services were totally paralyzed at Fatehabad where workers of the Haryana Roadways had been sitting in dharna since last night. Commuters were a harassed lot today. Karnal: The strike call evoked a mixed response. Employees of public sector banks and insurance companies, Municipal Corporation, BSNL, electricity, public health and mechanical wing of the PWD observed a strike. The banking services were partially affected as major private banks like HDFC and ICICI remained open. Haryana Roadways employees only supported the strike but did not participate in it. The All-Haryana Anganwari Workers and Helpers Union held demonstrations at Indri, Gharaunda, Nilokheri, Karnal, Assandh and other places to press their demands and express solidarity with striking employees. Though unlike in Punjab, where power is provided free of cost to agriculture sector, Haryana provides power to farmers at a highly subsidised rate. But the power subsidy bill for Haryana, at Rs 3,600 crore per annum, is almost as high as in Punjab. What makes the situation worse is the problem of non-payment of electricity dues by hundreds of thousands of consumers across the state. The outstanding dues from these consumers are pegged at a whopping Rs 3,200 crore, with the government soft-pedalling on the issue of collecting these dues from its traditional Jat voters. Even as the losses of the state power utilities have increased to a whopping Rs 7,100 crore, and the loans taken by the four utilities -- Haryana Power Generation Corporation, Haryana Vidyut Prasaran Nigam, Uttar Haryana Bijli Vitran Nigam and Dakshin Haryana Bijli Vitran Nigam -- touched Rs 15,268 crore, with banks refusing to extend more credit, political will seems to be lacking in controlling the losses by paving the way for a hike in power tariff, in consonance with the hike in the power input costs. Sources in the state power utilities said consumers were still paying almost Rs 2 per unit less than the actual supply cost of power per unit. The power tariff has not been revised in the past 10 years (except for a marginal hike effected last year), even as the cost of coal for running the thermal power plants in the state have been rising. Though new power generation capacity has been added in recent years, some of these power plants have been developing snags and power generation is hit. Talking to The Tribune, the state Power Minister, Capt Ajay Yadav, while justifying the power subsidy to the agriculture sector, said with the rising input costs in agriculture, the government had to subsidise power to farmers. “The issue regarding raising the power tariff is pending before the Haryana Electricity Regulatory Commission (HERC). The two power distribution companies have gone to the regulatory commission seeking a hike in tariff for 2012-13, showing a huge revenue gap of over Rs 7,000 crore. The government has no interference in this, and the regulatory commission has to decide on the new tariff,” he said. He also added that the state power utilities had managed to bring down the transmission and distribution losses from 41 per cent to 24 per cent now. Regarding the non-payment of power bills, Yadav accepted that a large number of rural domestic and urban domestic consumers in the Jat dominated areas of Bhiwani, Rohtak, Jhajjar, Kalayat and Hisar had not been paying their electricity bills. Senior counsel Nidhesh Gupta, arguing for Bishnoi, contended that Speaker Harminder Singh Chadha who had provisionally allowed the merger of five HJC MLAs with the Congress was rewarded with a Cabinet berth within months while the present Speaker was not hearing the case seriously. Speaker Sharma was frequently adjourning the hearings in the case without valid reasons, clearly indicating that he would not give his ruling until the term of the present Assembly expired, Gupta argued before a Bench comprising Justices Altamas Kabir and J Chelameswar. While the Speaker had allowed the merger of the HJC with the Congress, Bishnoi continued to be recognised as a member of the HJC in the House. How a party that lost its identity after the so-called merger could still exist in the Assembly, Gupta questioned. Further, the senior advocate pointed out that the five MLAs had claimed to have merged the HJC with the Congress on the basis of a majority decision taken at a party meeting on November 8, 2009. But in their letter to the Speaker the next day, they did not talk about the meeting or the decision. On the contention of the Speaker and the five MLAs that the Division Bench of the HC had slated hearings even after reserving its verdict, Gupta said there was nothing unusual about the court giving a final chance to the parties to clarify their stand. The arguments will continue tomorrow. The deceased’s father, Rampal Jangra, is a car painter. He had a son, who is now dead, and a daughter. He worked hard to meet the educational expenses of his two children. “Pradeep showed a lot of promise and topped his class. I had high hopes from him”, Rampal said. Rampal Jangra was a few steps behind his son when he was shot at by two classmates yesterday. He had accompanied his son to the college as Pradeep feared he would be beaten up by his classmates. The unfortunate father dropped him at the gate and turned back when the two assailants came out of the bushes and shot at him. Pradeep had a tiff with the assailants three months ago over a trivial issue which was resolved by elders of the three families. However, the murderous duo kept nursing a grudge. Pawan Sangwan, a teacher of the college, said Pradeep was a loner who never missed a class and topped in the three semesters. He added that Pradeep’s murder had shocked him as he had high hopes from him. Meanwhile, the police have ruled out a caste angle to the murder. Officials investigating the case also ruled out a “love” angle to the murder. The police said it was a three-month-old dispute that led to the murder. Two police teams have been constituted to apprehend the culprits. The motivational songs, “Har beti ka ye adhikar, puri shiksha pura pyar” and “Jab tak anparh nahin padhega, desh aage nahin badhega”, presented by the Saksharta jatha, moved the audience. The Director-General of the National Literacy Mission, Jagmohan Singh Raju, said it was a cause for concern that even after the top priority accorded to education by the states and huge money spent on education, 40 per cent of the people were illiterate. The situation of women’s education was even worse and there was a dire need to focus on women’s education to make them equal partners in socio-economic development of the country, he stressed. Calling for making Saksharta mission a people’s movement, local MLA Sumita Singh said the efforts of the government would yield results only if the masses at large take up the responsibility of making a literate society. Eradication of illiteracy was a must for rooting out social evils like female foeticide, dowry, drug addiction and superstition, she said. Power demand is more than 1,050 lakh units against supply of about 950 lakh units daily, which has resulted in a shortage of around 100 lakh units every day despite the overdrawals. As a result, consumers across the state are facing unscheduled power cuts for long hours. The daily overdrawals in the past five days are between 195 and 245 lakh units against the northern region’s total overdrawal between 163 and 294 lakh units for the corresponding period last year. Unit 1 at the Panipat thermal plant is shut down while unit 2 is under renovation and maintenance. The 210-MW unit 6 is under annual maintenance from February 7 to March 5 while the 250-MW unit 8 was revived after 26 days as it had developed leakage in its boiler. The 600-MW unit 2 at the Khedar plant is under general maintenance. The 300-MW unit 2 at the Yamunanagar thermal power plant is under forced shutdown due to heavy vibration in its turbine. Dhoop Singh, SHO, GRP, old railway station, said the youth killed in the accident was later identified to be Sami Singh Rathore, alias Bunty, a brother of Sharda Rathore. The family has identified his body. The Station Master was informed about the accident, who referred the case to the GRP. The SHO said the youth had apparently lost his balance on platform no 3 under the railway overhead bridge and fell on the railway tracks. Just then the Andhara Express passed over the track at full speed, crushing him to death. The body was said to be severed into pieces. The deceased is one of the three brothers of Sharda Rathore. Engagement for his marriage had taken place about two months ago. Taking exception to alleged fraud by HUDA officials with a Gurgaon resident, whose money was allegedly utilised by them to pay their monthly instalments, the Punjab and Haryana High Court today ordered the registration of an FIR against the errant officials. The directions by the Bench headed by Justice Hemant Gupta came on a petition filed by Ram Gopal. He alleged despite depositing fees for alleged violations committed by him, HUDA did not issued the completion certificate and was threatening to demolish his house in Sector 5, Gurgaon. Deeksha Rani of Bhattmajra in this district was killed and her mother, Mamta Rani, was injured when their Scooty was hit by a truck near Thaska Meeranji village, 32 km from here, on Monday. The police has registered a case against the truck driver.